ST. GEORGE – Two bills that would allow terminally ill patients access to medicinal marijuana and farmers to grow marijuana for research purposes under state supervision were given a favorable nod by lawmakers Wednesday as they were pushed out of a legislative committee and sent to the Utah House floor. Orem Republican Rep. Brad Daw presented substitute versions of House Bills 195 and 197 to the House Health and Human Services Committee Wednesday. The bills drew some concern from lawmakers and others, yet not enough to stop their advancement. 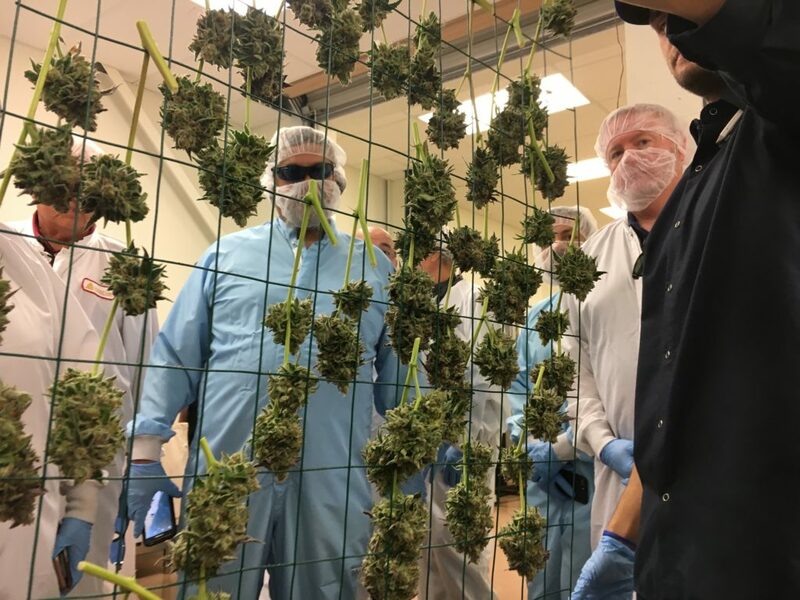 Daw described the legislation as being companion bills, as the marijuana that would be provided to terminally ill patients would be grown in Utah. There is research being done on CBD, the non-psychoactive portion of the marijuana plant, within the state, Daw said. However, if they really want to research and test the full extent of the plant’s potential medicinal use, then the entire plant, including the portion that contains THC, or the chemical part that is psychoactive and makes a user “high,” should also be explored. “We need to allow there to be a supply,” Daw said. House Bill 197 allows differing strains of cannabis to be grown by third parties under the supervision of the Utah Department of Agriculture and Food. Access to the marijuana would be provided through a state-run dispensary. This is where House Bill 197 connects with 195, as it is the point where terminally ill patients would be able to access experimental marijuana-based medications that are recommended by either a physician or nurse practitioner. House Bill 197 passed with a 7-3 vote, with three committee members absent. There were concerns expressed over the legality of both bills, however, as federal law still lists marijuana as an illegal schedule I narcotic. “The simple fact is the DEA will tell you what we’re trying to do is against the law,” Daw said, yet added Congress hasn’t provided funding for the prosecution of marijuana production and sale in states where it has been legalized. “At best, it’s a question mark,” he said. Speaking on behalf of the Utah Police Chiefs Association during the committee hearing was Ogden Police Chief Randy Watt. He told the committee the association wasn’t in favor of either bill due to their violating federal law. Rep. Rebecca Chavez-Houck, D-Salt Lake City, said she was worried about legalizing medical marijuana due to U.S. Attorney General Jeff Sessions recently telling federal prosecutors to go after states in violation of U.S. drug policy. Daw repeated that Congress hadn’t allowed any funding for such prosecutorial pursuits by the Justice Department. As well, he said Utah was unlikely to be among the first eyed by the Justice Department over the matter. Daw’s bills were “a very small toe in the water” of medical marijuana legalization, he said. House Bill 195, “Medical Cannabis Policy,” would allow physicians and nurse practitioners to recommend up to a month’s supply of medicinal marijuana for individuals considered terminally ill.
“If somebody’s terminally ill, a physician or an APRN (advanced practice registered nurse) feels they would be benefited, or potentially benefited by a cannabis-based medicine, they would have the ability to get to that,” Daw said. Medical practitioners under the law would only be able to recommend medical marijuana, and not necessarily prescribe it, Daw said. Doing this is seen as a way to help keep DEA licenses the physician or APRN maintain from being put at risk. The legislation would only allow for 15 patients to be given medical marijuana at one time, an element committee co-chairman Rep. Micheal Kennedy, R-Alpine, appreciated as it would keep any one doctor from becoming a “candy doctor” for marijuana recommendations. Under the proposed legislation, medical marijuana could also only be administered in medicinal form, such as pills, Daw said, and would not allow for it to be smoked or used in an electronic cigarette. House Bill 195 passed the committee in an 8-3 vote with one committee member absent. Representatives of TRUCE Utah, a medical marijuana advocacy group, said they agreed with the spirit of the legislation, yet said the bills were “problematic and limiting.” They argued that all patients in need should have access to medical marijuana while also saying Daw’s bills could run into legal issues the way they were set up. TRUCE advocate Christine Stenquist said the state needs comprehensive medical marijuana legalization so everyone with chronic pain can get relief, not just people whose doctors say they are dying. The 45-year-old suffers from trigeminal neuralgia, a condition that affects a nerve linked to the face. Bill sponsor: Rep. Brad Daw | Senate floor sponsor: Sen. Evan Vickers. Southern Utah Senators: Evan Vickers, Don Ipson, David Hinkins and Ralph Okerlund | Listing of all senators. Southern Utah Representatives: Jon Stanard, Bradley Last, V. Lowry Snow, Walt Brooks, John Westwood, Merrill Nelson and Michael Noel | Listing of all members of the House of Representatives. So it stands to reason that if state officials are willing to look the other way when it come to the cultivation and manufacture of a schedule 1 narcotic (a 1st degree felony, mind you), then I assume we will not be pursuing the prosecution of the same for schedule 2 narcotics? Afterall, cooking methamphetamine in a clandestine lab is still punishable by up to 15 years in prison. Why is that? I would argue that it has just as many healing properties as weed. If we are talking about bending the rules for just this one thing then we need to honestly consider reevaluating the entire Controlled Substance Act, if not eliminating the need to regulate narcotics within our borders period. I know one thing.. I would not be growing weed knowing the harsh penalties I would be facing pending the revision of certain statutes. And if they are not revised, I will have a hard time keeping faith in a judicial system that has no problem enforcing law without uniformity. The day our judicial system no longer sees the need to enforce federal and local law is the day we no longer will need a judicial system. This is typical of Utah’s half-a$$ed approached towards cannabis. I’m just gonna lay this out. Cannabis helped aid me in quitting an 8-year addiction to painkillers that nearly took my life and I have been free of them for over 2 years. I use cannabis daily to treat pain, anxiety, and depression. I live right here in S. Utah and I even drive over to Mesquite from time to time. Would you like to tell me about all the laws I’m breaking? Because I don’t care and I’ll tell you where you can stick that opinion. I’d rather take my chances crossing state lines than EVER allow another opiate enter my body from a lying doctor in a pill-mill. This is the 21st century. Not 1950’s America. Utah needs to get with the times. This healing herb has been used for THOUSANDS of years to treat everything from menstrual cramps to migraines. Cannabis heals. No, it is NOT for everyone. But it has the power to heal many people and save lives. I am proof of that and so are thousands if not millions of others. And there’s plenty of science to back that up. The biggest obstacle to cannabis become legal for ANY use in Utah is the Mormon church. Straight up. Anyone who tells you otherwise is blowing smoke(pun intended). I guarantee Utah will be the last state to legalize cannabis for medical use because of theology outweighing common sense. The notion that “more research needs to be done” is utter crap. Wake up, Utah. Time to stop taking pills and start taking something that isn’t manufactured in a chemical factory. That is awesome that you have had such success with the drug. Have you ever had difficulty in finding it? I mean prior to Mesquite opening a dispensary. Is the only reason you back legalization for peace of mind? Can you honestly say that smoking weed daily is a more healthy option than taking a pill daily? Afterall, the opioids flooding the market today are derived from a plant too; opium poppy. Isn’t that exactly why people are pushing for its legalization: in an effort to manufacture derivatives? I’m not trying to change your opinion in any way obviously, but on a personal level, isn’t smoke inhalation bad? Like deadly? I guess it doesn’t matter if we are only talking about legalizing it for the terminally and chronically ill. Otherwise, if it’s safe enough for our weakest members of society, then why isn’t it sold behind the counter? Smoking is not legalized under the ballot initiative. Daw is certainly not in favor of smoking, either. Patients should not have to be dying in order to find relief. Weed is safer than opiates, even safer than Tylenol…no one has ever died from a weed overdose. Look it up if you dont believe me, there’s not a single instance of cannabis overdose death. You have to ingest a pound per minute for 15 minutes to even get near a toxic level. If we are talking about terminally ill patients in chronic to severe pain why not start prescribing heroin? As it is derived from morphine, and also a schedule 2, that’s essentially the only thing it’s good for. Marijuana is a life saver when it comes to naseua and migraines, but those issues are only chronic until the underlying issue is solved. I honestly do not think there are enough people out there that would benefit from its legalization to warrant any change to the law, let alone justification for funding. The fraction of the population that needs weed to function probably has no qualms with the way it is currently distributed in the market. Those looking to legalize are only interested in potential for profit in mass distribution. That being said, why is no one asking the questions that actually matter? If we are to begin farming this stuff, then where would the margin of profit lie? Who would be making the most money? Field workers/retailers/dispensary owners/doctor kickbacks/insurance companies/ Medicaid? Cultivation of pot is not an easy task. I would assume we would be regulating its growth strictly to those with backgrounds in horticulture/botany. I mean eventually will it be harvested like wheat? In the event that an entire seasons crop is lost who will be eating the cost of starting over? If done properly, I think research should be government subsidized in the form of grant money awarded to the state’s universities. Allow trained professors and scientists, along with students, to research the benefits of cultivation and consumption in a research setting before submitting their official findings. If marijuana really is a miracle drug, then we should be exploiting this opportunity in an effort to cure more than just chronic pain. Well Jamie, you sound like you might have all the answers. What is your world experienced view as to how we all should live and who we should take orders from based on their personal views. Obvious you no nothing of the wonderful world of medicine and research. I am guessing that the folks who would benefit from THC are already accessing this product in various forms, with the guidance of their doctor. If this legislation miraculously passed the state religiouslature, it would reduce the legal implications if these folks were somehow caught by LEOs. 10 years ago this might have been meaningful, but with states on both our eastern and western borders legalizing marijuana for personal consumption, in many forms, this almost seems quaint. Growing weed for “research’ purposes is an attempt to catch up to other states who have been cultivating weed, for research purposes, for years. Medical professionals have recognized THC as an option for their patients. It seems like we are still missing conclusive empirical evidence, although there is plenty of anecdotal stories, which are encouraging. Actually there is evidence (actual, conclusive research studies, plural) that cannabis does relieve chronic pain and muscle stiffness. Other medicinal uses are presently anecdotal. Most people would agree that it is a relaxant. The bottom line is, these jackwagons keep calling for more studies, when there are plenty of them already. The only thing not ready for legalization is them… they dont have everything in place to profit from this, so they want to stall. Follow the money, why else would Senator Evan Vickers, a pharmacist, want weed only sold through pharmacies?? 3.0 Utah Marijuana Ha Ha ! If Isreal can legalize cannabus use, we should. Utah is too full of drug use. Cannabus is medicinal. Research? Really? Like there hasn’t been a bazillion dollars already spent on “research” of cannabis.